Families in Northeastern Pennsylvania confront severe economic challenges, including elevated levels of unemployment and extreme poverty. While there are many families that fall below the “official” measure of poverty — the federal poverty line — there are also many who work full-time but earn less than a living wage. Individuals and families lack economic security in both cases; but the latter find themselves in an ambiguous situation, which this report seeks to clarify. To be classified as economically secure, a household must earn wages that allow its members to meet their “essential basic needs and live a modest but dignified life.” The living-wage threshold represents the amount of income required to achieve this standard of living. This living wage study was prepared by the Institute for Public Policy & Economic Development in partnership with Education for Justice and the Office of Community & Government Relations at The University of Scranton, and with additional collaboration from Campus Ministries’ Center for Service and Social Justice and the Department of Communication. ﻿Completed by students in Communication 224: News Writing taught by Dr. Kim Pavlick, Assistant Professor. Department of Communication. Completed by students in PSYC 364: Psychology of Diversity taught by Dr. Jessica Nolan, Associate Professor, Department of Psychology. ﻿To achieve family economic security, a multi-pronged approach is required that involves economic and workforce development, government social safety net programs, and private charitable activities. The following recommendations reflect conclusions drawn from the data presented in this report and based on the advocacy efforts and policy positions of Catholic Charities USA and the U.S. Conference of Catholic Bishops' Poverty USA Initiative, illustrating the rich discussion of poverty, just wages, and economic justice present in Catholic Social Teaching. To learn how you can take action in support of policies that promote a "living wage", please visit the Advocacy Corner. ﻿The Living Wage Report 2016 brings attention to the challenges confronting Northeastern Pennsylvania's working poor. The report calls for us to reflect on what we can and should do individually, communally, and as an institution of higher learning. As a result, Andrew Milewski, University of Scranton Class of 2013 and Education for Justice graduate assistant for fall 2016, developed a series of questions to help guide reflection in order to help us better understand how we may respond. Click here for the reflection questions. Dr. Will Cohen: "Living wage as matter of basic human dignity"
Dr. Meghan Ashlin Rich: "Living wage critical to city’s revitalization"
Dr. Jessica Nolan: "Kernels of truth yield bushels of stereotypes"
Dr. Michael J. Jenkins and Dr. Ismail Onat: "Offset Crime's Impact on Disadvantaged"
Dr. Linda Ledford Miller: "Melting Pot Stew's Language"
The Scranton Times-Tribune, Jon O'Connell: "Local income disparity widens"
The Scranton Times-Tribune, Denise Allabaugh: "Governor proposes raising the minimum wage to $12 per hour"
The Scranton Times-Tribune Op-ed, Kevin Quinn, S.J. : "Need for Living Wage Tests Community's Resolve"
The Aquinas: "Living Wage Study Shows Poverty in Lackawanna County"
Ignation Solidarity Network: "University of Scranton 'Living Wage' Study Reveals Lingering Income, Job and Social Service Challenges in N.E. 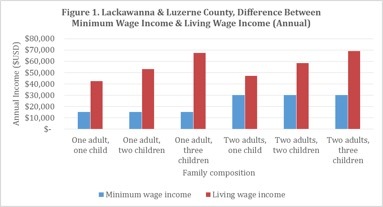 Pennsylvania"
Times Leader: "What is a 'living wage' in Luzerne and Lackawanna counties"
Scranton Times Tribune: "Study: wages in region fall short of state average"